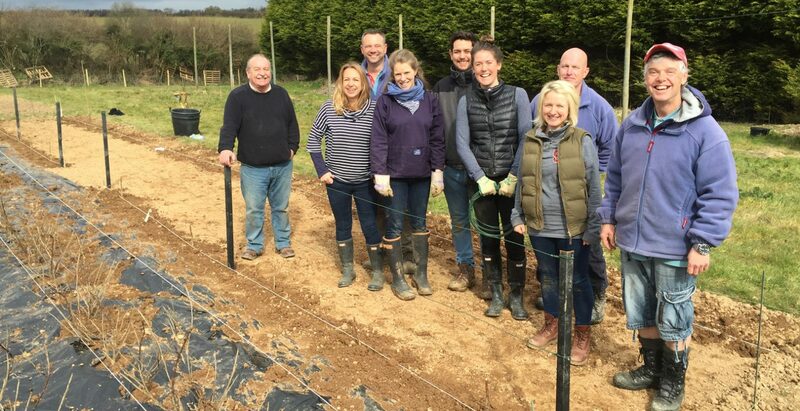 Earlier this month, to welcome the newest members to Barefoot, we had a team outing to People and Gardens at their nursery near St Austell. We started working with community interest company People and Gardens in 2013 to create their new website. Since then we regularly visit to catch up with old friends and help out where we can. People and Gardens was set up by Ken and Lorraine Radford in 1997 to enable people with learning disabilities or emotional impairments to be able to develop as individuals, to learn work and social skills and to have equality of choice and opportunity in the workplace. They believe that gardening can help their participants achieve a sense of well-being, satisfaction and self-worth. We introduced Holly, Sarah and Chris to the People and Gardens team, and after a warm welcome and a cup of tea, we were all set to work. 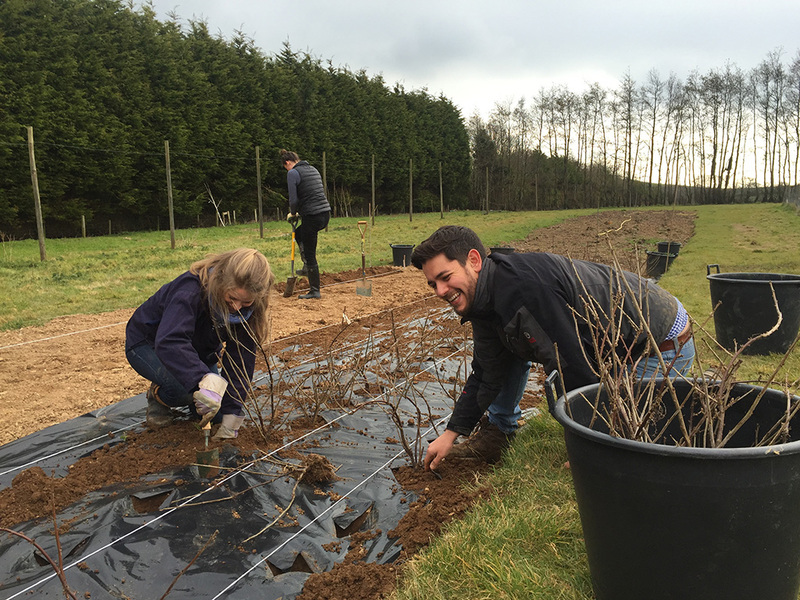 Our task for the morning was to plant a large bed of redcurrant bushes and raspberry canes. The ground had been prepared ready for our arrival and so we had the satisfying task of nesting each bush in it’s allocated spot, creating three neat rows ready to spring to life. Following a successful Crowdfunder appeal People and Gardens plan to purchase a new fruit cage to prevent the birds from sampling the majority of the berries. By the time the fruit begins to appear the cage should be safely overhead saving the crops from the eager Pentewan wildlife. We chatted to the project’s Development Manager Bill Simpson while we worked, who introduced us to volunteer Nick and also Sean who regularly attends the group at Watering Lane Nursery. We shared redcurrant recipes including compote, jam and cordial. We then joined People and Garden participant James for a spot of digging before we all downed tools for lunch. Luckily the weather was kind and we all sat outside on the picnic benches. Over lunch Jim had been admiring the needlework of regular visitor to the project Ruth. He was rewarded with a beautifully knitted flower that now has pride of place on his desk. Following a quick game of football Bill took us to the impressive green houses and we were shown more of the project’s work. The group grow vegetables and salad for their fortnightly veg bags and also supply the Eden Project. We were invited to sample some very tasty Mizuna lettuce and each treated to a pot of chocolate mint to take home (named not due to taste but for the brown colour of the stalks, delicious all the same). We are very grateful to everybody at People and Gardens for welcoming us to Watering Lane Nursery and letting us pitch in for the morning. Although the nursery is very industrious it is also a very peaceful place, and we would have been happy to stay and work all day. 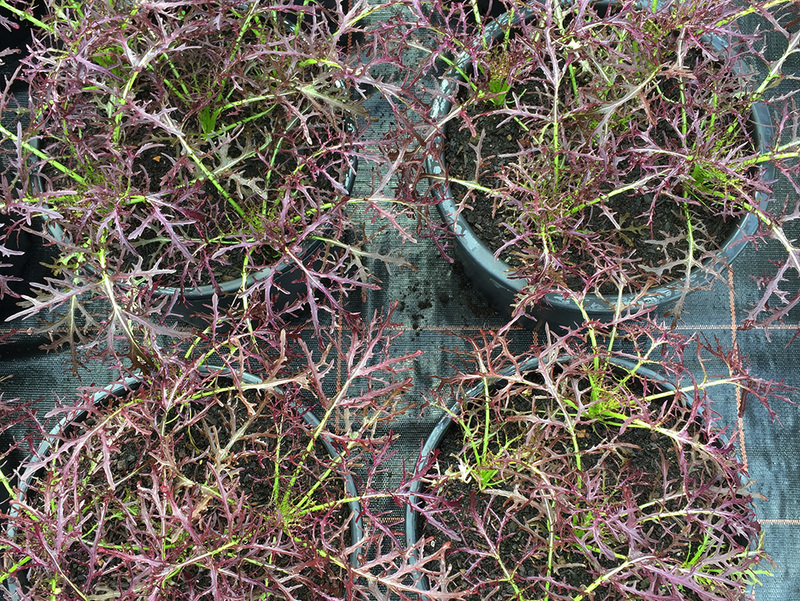 You can keep up to date with the nursery on their Twitter and Facebook pages, or visit their website www.peopleandgardens.co.uk for more information.